Anyone who's traveled with kids knows that an awesome pool is a very welcome amenity. Check out these ranches and horseback riding vacations with great pools for kids... and adults. Want to ride horses and stay at a ranch, resort or horse riding vacation spot with a nice pool for the kids? Lots of great ranches have pools, but some have real stand-out pools–– pools that will make your kids jump for joy and love splashing around. 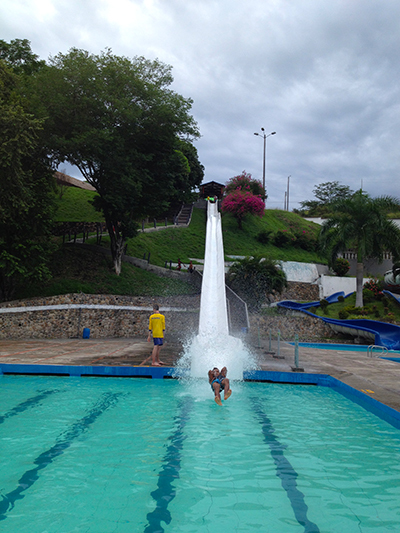 Check out the five of the top riding vacation destinations with phat pools! And more choices for riders who want to also swim. Tanque Verde Ranch in sunny Arizona has a pool that kids and adults love. With views of the surrounding desert, the water is a welcome respite after a day on the trails. Tanque Verde Ranch has an indoor and outdoor swimming pool, as well as indoor and outdoor whirlpools. A separate children’s wading pool is adjacent to the larger outdoor pool. Plus, there's great riding through the Sonoran Desert for adults and children. 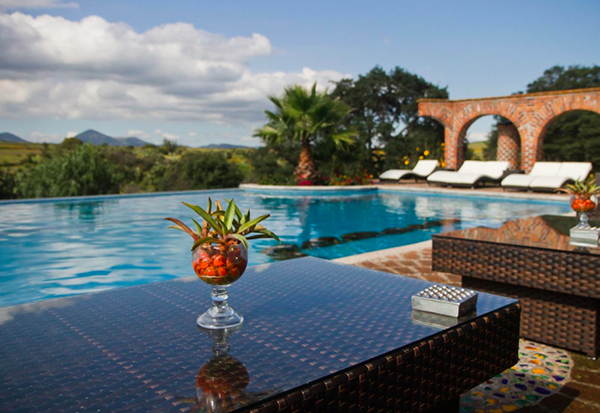 With a solar-heated infinity pool, Jacuzzi, hot tub, spa and wide open spaces for horseback riding, this Mexican ranch under Swiss ownership is a great choice for families looking to discover Mexico on horseback. Located just 90 minutes North of Mexico International Airport, this ranch cooks up home-cooked meals using local ingredients and, of course, you can include with that a margarita by the pool. 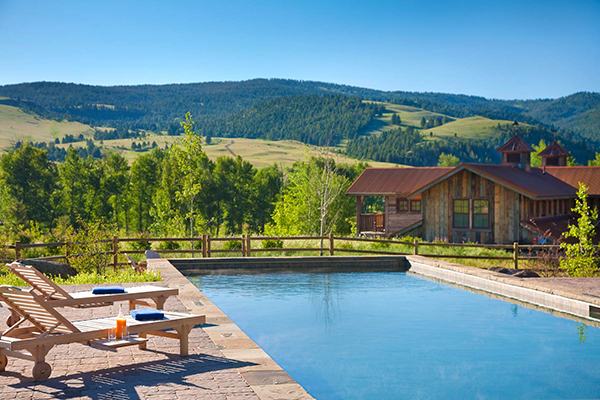 The Ranch at Rock Creek is a luxury guest ranch whose heated pool, with its patio and Jacuzzi, has Montana views to die for. Set on a ridge overlooking the valley, the whole family is welcome to sunbathe, splash around and relax after a day on the trials. Kids may also enjoy participating in the Little Grizzlies Kids Club and everyone can enjoy-- stagecoach rides, bowling, billiards, shuffleboard, movie cinema and board games. 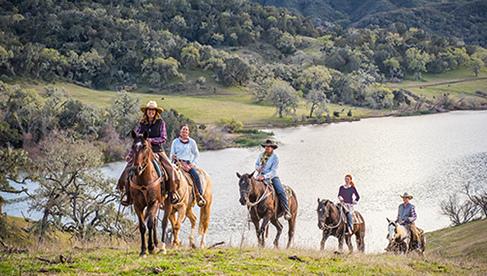 With more than 50 horses and endless trails and terrain, there's a lot to love about this upscale ranch. Ranch at Rock Creek's website. This Colorado ranch, a great pick for all ages, has a heated pool and hot tub, complete with snacks and a full bar. The ranch also has a comprehensive ranch program for kids and teens, as well as special clinics and events throughout the year. NOT a nose-to-tail dude ranch, C Lazy U’s wranglers use natural horsemanship techniques to train easy-going and forward-going horses. Based from boutique hotels in the historic city of Honda in Colombia and with horseback riding at a nearby, family-owned hacienda, guests can choose to stay in a hotel with a pool or a hotel with a waterpark. Walk up the cobblestone streets to Hotel Boutique Posada Las Trampas, set in a colonial-style house with a lovely swimming pool with high views of the city. Hotel y Parque Acuático Agua Sol Alegría is geared towards families, with rooms that can accommodate from 2 two 7 people in one room. Staying here gives you entrance to their waterpark and at both hotels, management will arrange transportation and riding at El Triunfo Ranch or Hacienda el Triunfo, which was founded in 1901 and is one of the biggest cattle ranches in Colombia. 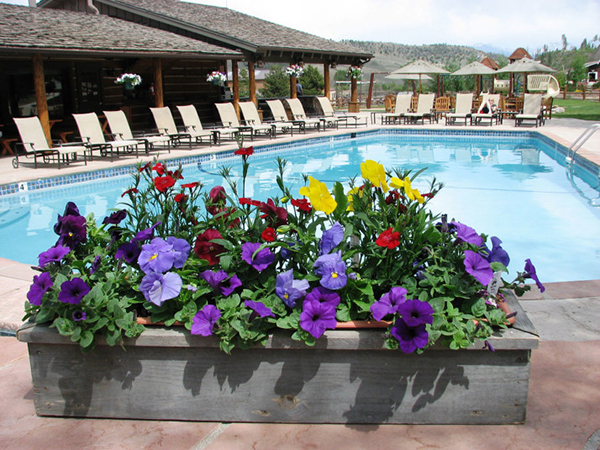 The Hideout Lodge & Guest Ranch has a brand new, beautiful pool for guests. What is more rewarding and relaxing after a day in the saddle than dipping in a pool with crystal clear, refreshing water? 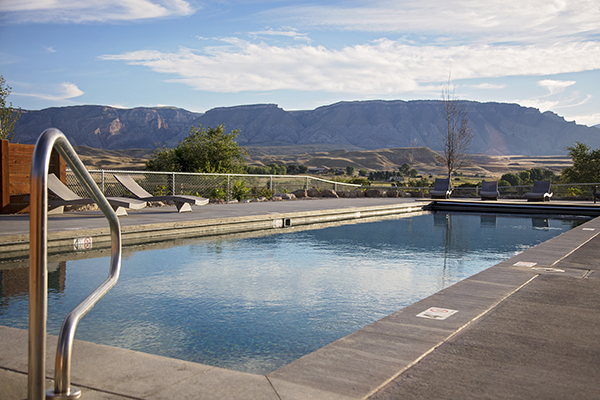 The Hideout's 60’ x 18’ lap pool is 4 ½ - 5 feet in depth, and resembles an infinity pool as you swim directly towards Shell Canyon and the Big Horn Mountains. The pool is managed by a state of the art computer and cleaning system, which reduces the use of harsh chemicals. Adjacent to the pool is a stylish log pool house where guests can escape the strong Wyoming sun. The pool is secluded from the cabins and lodge to provide a peaceful and private place to relax. What's not to love? 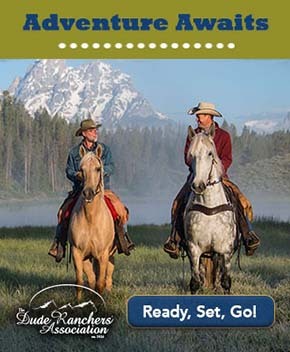 Check out more dude ranches & riding vacations with pools in the Equitrekking Vacation Guide.